Primalix® PV for Canine Parvovirus, when given along with our emergency protocol, gives your dog a 90% chance of survival compared to a 90% chance of dying without treatment. Because it may be the only chance you have to save your puppy! Primalix® PV for Canine Parvovirus, when given along with our emergency protocol, gives your dog a 90% chance of survival compared to a 90% chance of dying without treatment. Primalix® PV is a holistic blend of seven healing herbs from Ayurvedic and Traditional Chinese Medicine. All herbs combine to treat all symptoms of Canine Parvovirus, plus we add a natural antiviral to combat the virus itself. 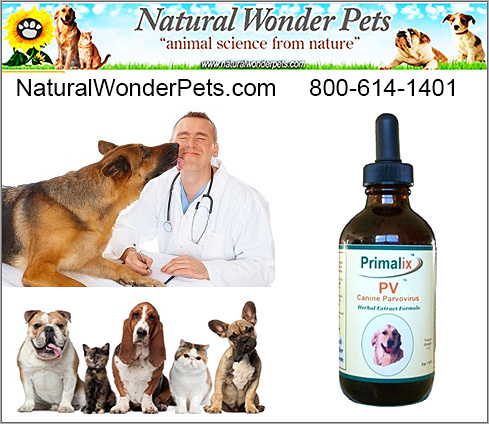 Primalix® PV comes in a 4 oz. glycerite alcohol-free tincture with dropper. Our customers swear by it! How Do I Know If My Puppy Is Coming Down With Parvo? The first symptom of Parvovirus is lethargy followed closely by loss of appetite, diarrhea and vomiting. A veterinarian's diagnosis is always best, but any sign of extreme intestinal distress will require closer observation and immediate action! Call us and order so you will have the product on hand! If you are a ‘breeder’, you will need to keep Primalix® PV for any emergency parvo situation with your puppies! Primalix® PV was formulated specifically to combat the symptoms of C. Parvovirus, including the more recent CPV2c, in all breeds of puppies and adult dogs. Our proprietary formula is a scientific blend of USDA Certified Organic herbs, antioxidants and phytonutrients. Each ingredient is clinically proven (and customer tested) to activate natural canine defenses that empower biological systems and restore wellness. Known simply as the genial sounding ‘Parvo,’ this disease is anything but friendly. A relatively new virus (it was only discovered in 1978) Parvo has quickly spread throughout the world-wide dog population. Parvovirus is highly contagious and is passed on through contact with infected dog faeces. There are two forms of Parvovirus, cardiac and intestinal. The cardiac form is less common and usually attacks young puppies causing respiratory or cardiovascular failure. The intestinal form of the virus is much more common, affecting both adult dogs and puppies. Parvovirus attacks the bone marrow, the producer of the body’s blood cells. Any virus which seriously affects the production of new cells deals a major blow to the body’s immune system. Parvo also attacks the lymphatic system and can severely damage the gastro-intestinal tract. The virus can lead to Myocarditis (inflammation and infection of the heart muscle) and in extreme cases it can cause Sepsis, an infection of the blood. The first symptom of Parvovirus is lethargy, closely followed by loss of appetite, diarrhea and vomiting. Diarrhea and vomiting inevitably lead to dehydration and this is often what kills a dog rather than the virus itself. Loss of protein and blood (which leak into the intestine) can cause anemia. Damage to the intestinal lining and weakening of the immune system also greatly increase the risk of secondary infection, another cause of death. On the other hand, it is possible to avoid inflicting this drugstore cocktail on your dog. But What Can I Do NOW Until The Primalix PV Arrives? GIVE Emergency Hydration Tead EVERY 30 MINUTES FOR 24 TO 48 HOURS. THIS IS CRITICAL!!! Order Primalix® PV TODAY and Give Your Puppy A Fighting Chance! Our staff is happy to talk to you about saving your puppy and will help process your order immediately for fast shipping. Call us today and we’ll help get your puppy on the road to the best possible chance for a full recovery!